Casey Cone, administrator at The Fiber Mill, inspects 300 pounds of incoming exotic animal fiber. At the spin frame machine, employee Pat Alger adjusts yarn rovings as they are spun into single-ply yarn. This finished Alpaca yarn will soon head to a satisfied customer for private use or to sell. What once kept an alpaca, llama or Angora goat insulated from the elements is now a felt pad ready to equally meet some aspect of human need. This friendly Alpaca came along for the ride, painted on the side of one of the Oregon-purchased machines. 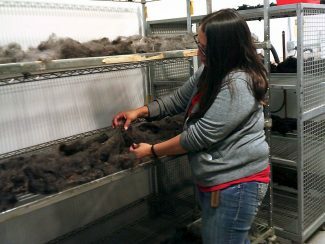 There's a shortage of animal fiber processing plants in the United States, said Donovan Warnick, owner of The Fiber Mill in Wellington, Colo. He said that back in the 1960s, issues with taxation and wages drove the textile-related industry from mainland USA to offshore countries. There they largely remain, working mainly with wool from prolific producers. People might recall some of those homemade "back to nature" fads of the '60s-'70s, such as intricate macrame plant hangers, gaily patterned lap robes, or knitted skirts/coats and the like. But, while many in-vogue trends die off, others simply take long, restorative naps. Casey Cone, administrator at The Fiber Mill (and Warnick's mother-in-law), works in one of those revived fields. About 15 to 20 years ago when exotics and alpaca breeding became all the rage, fascination with traditional fiber-crafting skills re-awakened. Cone noted that this phenomenon is international, especially in Germany, India, Pakistan, Italy and China. Much closer, about 16,000 alpacas alone, not to mention soaring head counts of llamas, yaks, goats and other fiber-producing species, call Colorado home. The resurgence of natural materials for knitting, crocheting and related skills has sparked a comeback of cottage-size mill machinery manufacturing, especially for smaller units of fiber. The dilemma in North America is that only two companies fabricate it: Stonehedge Fiber Mill Equipment, LLC in Michigan and Belfast Mini Mills, Ltd., on Prince Edward Island in Canada. 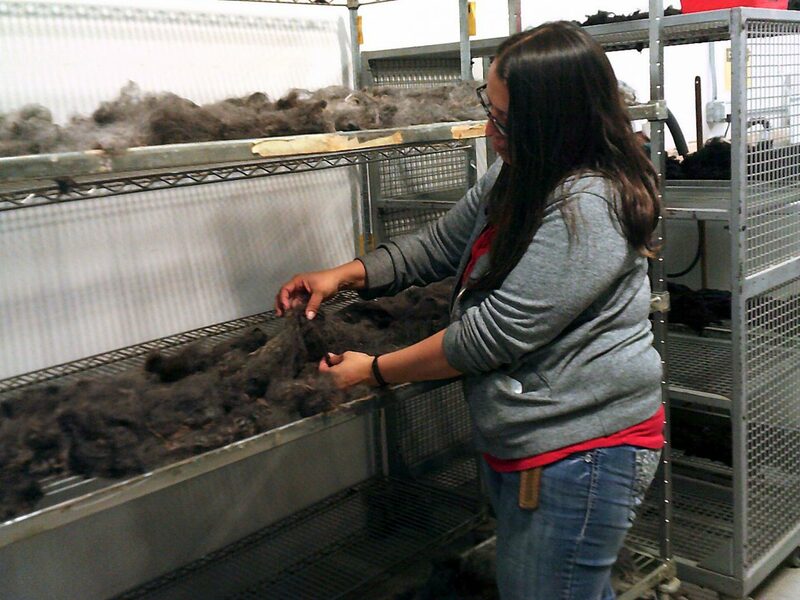 Despite all the Rocky Mountain state's many fiber-producing critters, there are approximately seven cottage-size processing mills currently operating in Colorado. But in August 2017, a southern Colorado mill popped up for sale on Craigslist. It immediately caught Warnick's attention. The entrepreneur, who owns a 40-acre farm for fiber animals sheep and llamas, as well as horses and an array of poultry, rabbits, etc., had considered opening a mill years before to combine his farm and career backgrounds. He immediately responded to the Craigslist ad. Although that deal didn't go through, Warnick wasn't giving up. He enlisted Cone's talent for business planning. She was quick to praise her adviser at the Small Business Development Center of Larimer County in Fort Collins for the valuable expertise they shared. In early 2018, Warnick and Cone learned of some cottage mill equipment for sale in Lebanon, Ore., when that facility's owners retired. Not letting any grass (or fiber) grow under their feet, Warnick bought all the equipment while Cone secured and set up space in a Wellington industrial park. That was in May and, by June, The Fiber Mill was up and running. Neither Warnick nor Cone had any previous experience in actually milling fiber. Being a decades-long knitter and angora rabbit fiber spinner, Cone has a personal as well as business interest in fiber crafts' history, but she lacked industrial, hands-on knowledge. Warnick's resume includes a vast manufacturing background and a 15-year position in Research and Development with a Fortune 500 company but, as Cone, he had no direct fiber processing skills. Warnick hired a couple of employees prior to arrival of the Oregon equipment and sent one of them, Pat Alger, to the northwest to spend a full week of intense training on it. 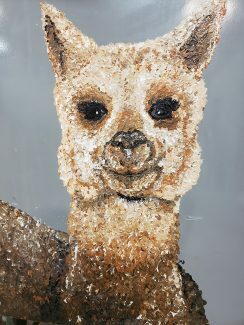 Alger has over 20 years experience in the Alpaca industry, is the owner of the Timnath Alpaca Ranch and has six years of experience working in a fiber mill processing wool and exotic fibers. She is also a capable alpaca fiber grader and judges in local Alpaca shows. April Miramontes and Brian Lauzon also initially came on-board, while Ira Vick was recently added to the payroll in October 2018. The combined experience of The Fiber Mill crew includes various manufacturing and processing backgrounds and all were quick studies who adroitly mastered the occupation's multiple techniques and steps. Now everyone at The Fiber Mill, inlcuding Warnick and Cone, is able to efficiently and safely operate every machine. Taking a batch of raw fiber to finished product requires approximately 40 non-sequential actual hours. Accounting for drying time, pauses to receive and enter new orders, balancing first in/first out and other tasks, 40 hours of processing time can translate to two to three weeks of actual wait time. Because The Fiber Mill is new in the industry, its growing customer base is still relatively small. Warnick noted that longer established (and therefore busier mills) take up to one year to 18 months to get established. Not only that, there can be a lead time of up to one year just to send fiber to them. Most customers expect and plan for that long reality. Through creativity and in time-efficient processing, Warnick hopes to fine-tune The Fiber Mill's productivity to a mere three to six months wait time even after the fledgling business expands. What does The Fiber Mill process? Currently, wool, alpaca, llama, mohair, other exotics, and blends such as alpaca/bamboo. 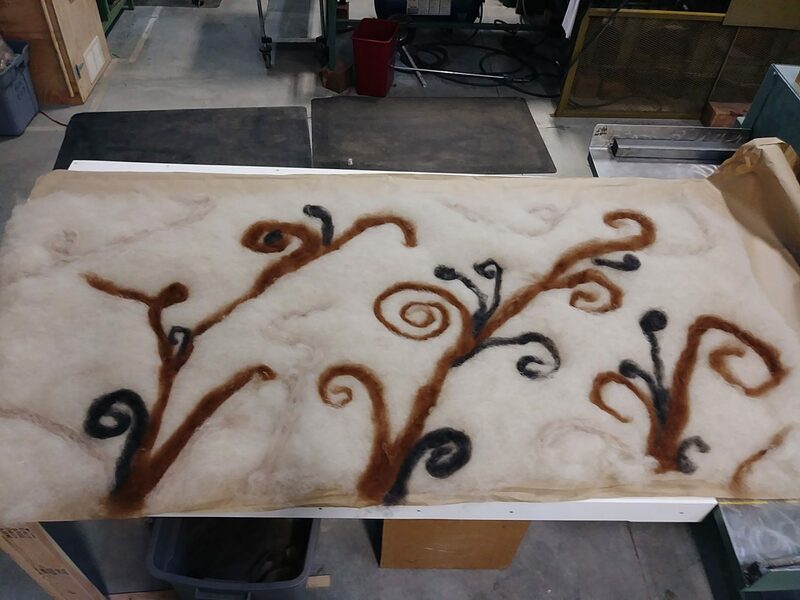 While most is transformed into yarn, one machine efficiently produces felted wool used in saddle pads, tent insulation, shoe lining and more. Patterns can also be woven in. At the present time, the mill receives 400 to 800 pounds of fiber monthly. Warnick said that processing timelines depend on the type of material, batch size, and ordered final form (yarn vs. felt). Runs are faster for single-use orders; if a batch is to become half yarn/half felt, for example, machinery settings and procedures must be changed in between, which lengthens wait time. One important caveat is especially critical in Colorado's arid climate: humidity. Dust and dryness can damage machinery so monitoring and adding appropriate moisture content to the environment is a constant concern. 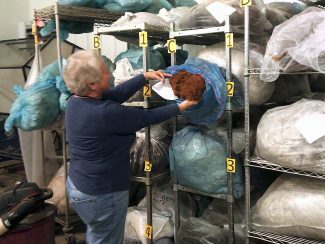 Cone said each step along the route from intake to finished product, beginning with approximately 300 pounds of shelved fiber awaiting handling to earlier batches, go through a variety of stages. Among the maze of machines, several batches of fiber were variously soaking in tubs or laying on drying racks, each awaiting their turn on the "carder." Built in 1929, this particular mechanical carder was designed as a cotton carding machine but has been modified over many decades. As once-tangled and/or matted material exits that extremely big brother to old-fashioned hand carders, it becomes what is called the "cloud." As is a cloud, the fiber is now a billowy soft and light-as-a-feather mass. If destined to become yarn, the fiber proceeds to the "rover," where fluffy cloud becomes a long "roving." The "pin drafter" machine is next and can handle up to five rovings at a time to produce the correct gauge consistency for spinning. 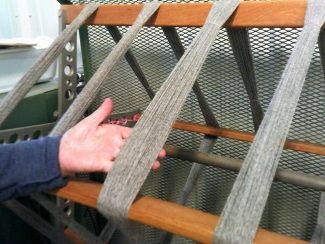 Moving along, the "spin frame" machine lives up to its name, spinning the rovings into single-ply yarn. After a time on the "plyer," it's on to the "skein winder," which displays the final yarn product. Other optional stops along the way depend on the fiber's ultimate usage or initial source. For example, angora goats have long guard hairs which must first be removed at the "de-hairing" machine before their fiber can be transformed into mohair. Fiber intended for felt heads to the felt "table," which is actually a multi-step station that includes the "needle felter." But, at every station, mechanized processing is always simlutaneously a hands-on operation. "It's a very touchy/feely business," Cone said, but qualified her quip with an equally light comment about time and stress factors, "There's lots of caffeine and sugar involved in this process." A learning curve is a supposed necessity for new businesses, but watching The Fiber Mill in action seems to dispute that old adage. Cone said they believe in a teamwork standpoint for success. Fiber growers can get additional information at http://www.thefibermill.com or call (970) 286-5209.